High levels of chicken and sugar imports, much of it dumped below the cost of production, are doing continuing damage to two of South Africa’s biggest agricultural industries. This is illustrated in the annual results announcement from RCL Foods, a significant producer of both products. 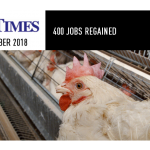 After years of losses caused by predatory and dumped imports, the RCL Foods chicken business returned a healthy profit – but only because of a massive cutback in production to avoid competing in parts of the market now dominated by imports. The cutback, from 4.8 million birds a week to 3.4 million birds a week, has cost the jobs of nearly 2 000 workers. The restructuring reduces the company’s vulnerability to the market for frozen leg quarters, where imports have started to dominate, and focuses production on the more profitable market for fast-food restaurants. Leg quarters are sent at rock-bottom prices to South Africa and other countries because Northern Hemisphere consumers don’t want them. They prefer chicken breast meat, which producers sell to them at a premium, and then dump the brown meat – mainly thighs and drumsticks – on any market that will take them at any price they can get. Other major chicken producers are also changing because of the threat posed by cheap imports. 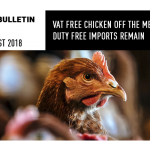 Astral, South Africa’s leading producer of what is known as commodity chicken, said in a results presentation earlier this year that imports now comprised 30% of the local broiler market, and companies were having to cut back as a result. Producers cite the lack of tariff protection to safeguard the local industry and its jobs from an ever-rising flood of imported chicken. This had led to import volumes rocketing, particularly since 2010. The South African sugar industry is similarly suffering under a surge of cheap imports. RCL Foods blamed imports for the 44% drop in profitability at its sugar business. 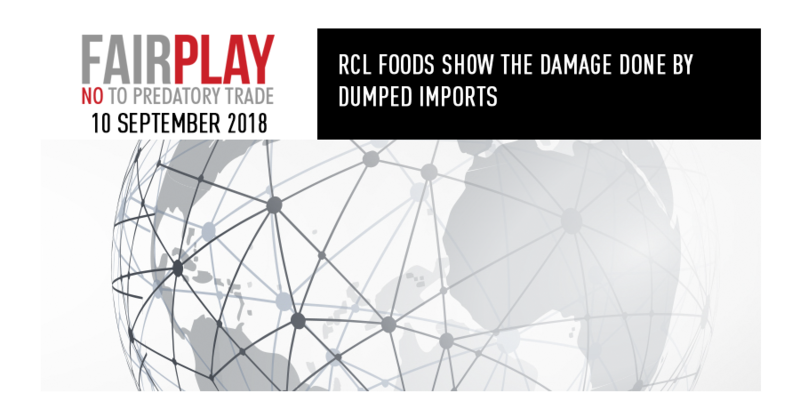 ”Increases in sugar production and improved efficiencies were more than offset by the impact of significant volumes of dumped imports,” commented the RCL Foods chief financial officer, Rob Field. He said local producers could not compete with imports on price, because foreign producers could land products in South Africa below their cost of production. The FairPlay movement is a not-for-profit initiative with the goal to end predatory trade practices that threaten the livelihoods of workers. FairPlay was established in South Africa and includes partners from South Africa, the USA, Canada, UK, Ghana and Ireland.